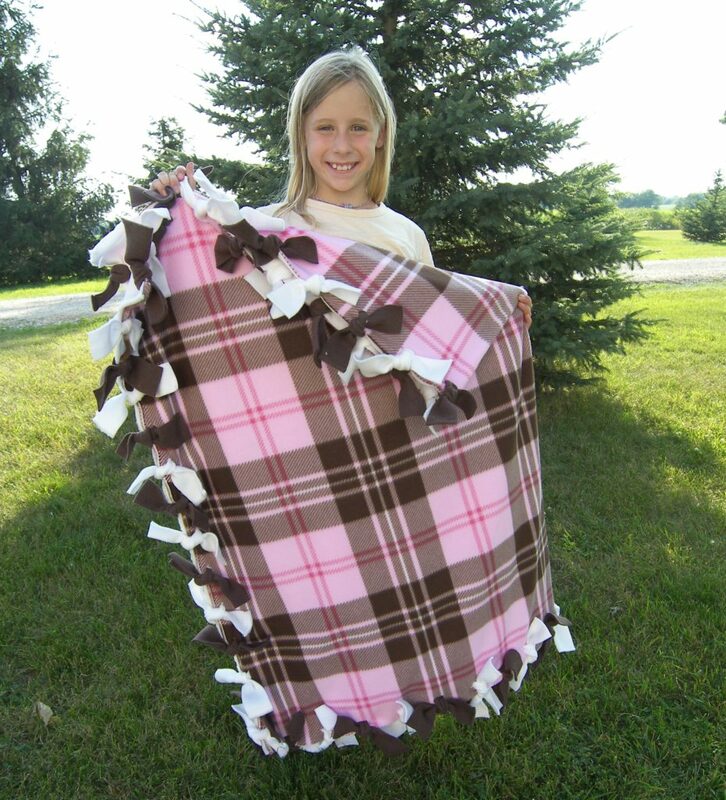 Fleece blankets can be a great option to quilts if you have limited sewing skills (as in a young person), short on time and are cost effective. Polar fleece is made from a synthetic polyester blend fabric. It has a two-sided pile, meaning the fabric is the same on both sides. It is very strong, holds warmth and dries quickly, which is why it was originally used by outdoor enthusiasts instead of wool. The structure of the pile surface of the fleece makes air pockets to keep the wearer or user, warmer than wool and other fabrics. Over the past decade this fabric has become a popular choice for the “tie blanket” projects we see. Just walking into any large craft store you can easily become overwhelmed by the 100’s of bolts available to consumers these days. For our family we have made several of these for the children and for charity. 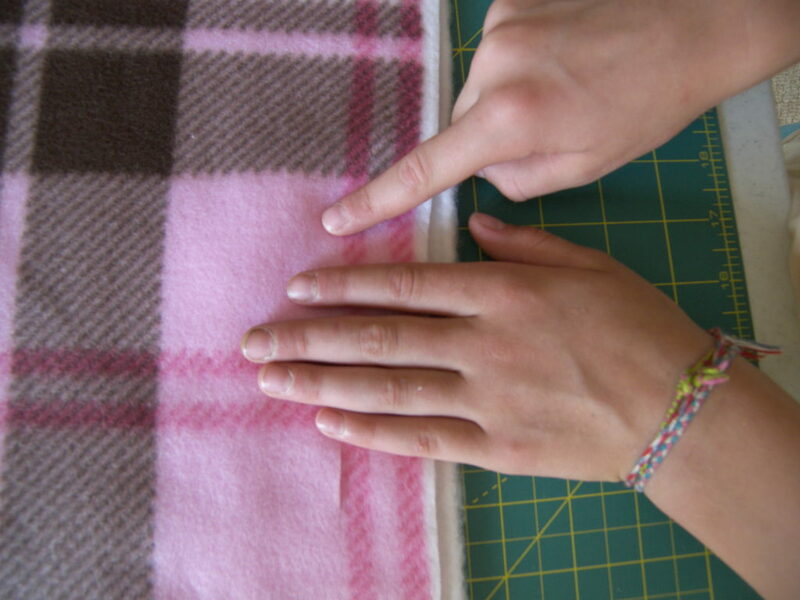 Here is a photo of Gene Anne in 2009 making her first tied fleece blanket. At this time she would have been 9 years old, and in her 4-H club they made these for charity and she wanted to make one for herself and take it to the county fair as a project. Here are some guidelines to consider when choosing fabric and how to make yourself one. Choosing the Fleece. We typically find a print we like and a contrasting or matching solid. For this one, she liked the pink and brown plaid and used a solid white for the backing. She felt it was a good combination of colors for contrast. Some patterns that don’t seem like they would go together actually complement each other quite well. I feel you will know what looks good when you are out shopping and lay the fabrics out side by side. Decide How much Fleece to purchase. What will be the use of this blanket, is it for a little tot, then a 60 x 60 inch square would be a nice size. Typically fleece is sold in 60 inch widths, so if this blanket will be for a teen, you may want a 60 x 80 or 90 inch blanket. Also consider how you are tying the edges, if you are using the fleece of your blanket and not adding ties, this will decrease the size of the finished blanket. Lay out the fabric on a large flat working surface, 2 tables set up side by side works best here. The softer or more brightly colored sides face out, matching both up at one end and the sides so they lay flat, trim if desired. We feel the fleece does not have to match up perfectly because the edges will be tied, and tend to curl, so when it is complete there will be no straight edge. Preparing to tie.The typical way folks tie the edges is not how we have done it. I can remember years ago seeing tied blankets that others had made and after a few uses they would be coming apart, they would not last. Also, I did not like how the blankets would curl around the edges, not lay flat and just seemed to be a “ball of a blanket”. I felt there needed to be a better way of tying them and came up with this. I am hopeful you can see what we are doing, we are using the rotary cutter to simply make slits through the two layers of fleece. I would estimate it is about two inches from the outside edge. For Gene Anne’s project she used the width of her hand to measure the space between each slit. 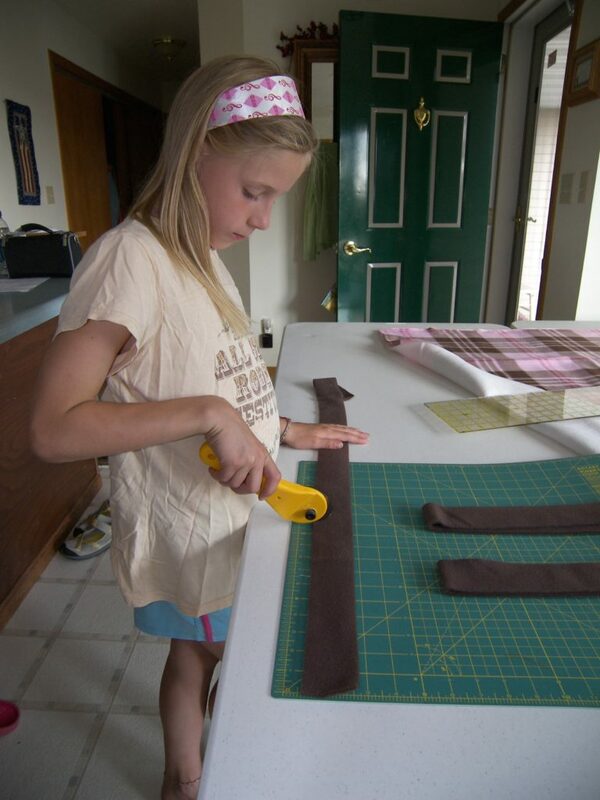 At age 9 we want the fabric projects to turn out well, but we need to be careful as to not overwhelm or frustrate them to the point of not returning to “sewing”! 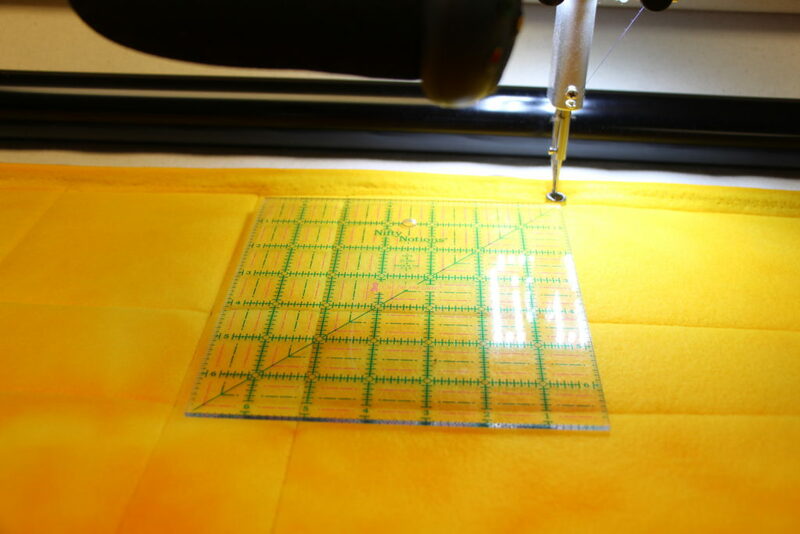 Fleece blankets are forgiving, so when you get close to the end of cutting the slits, you can adjust the space to make it come out fairly even. 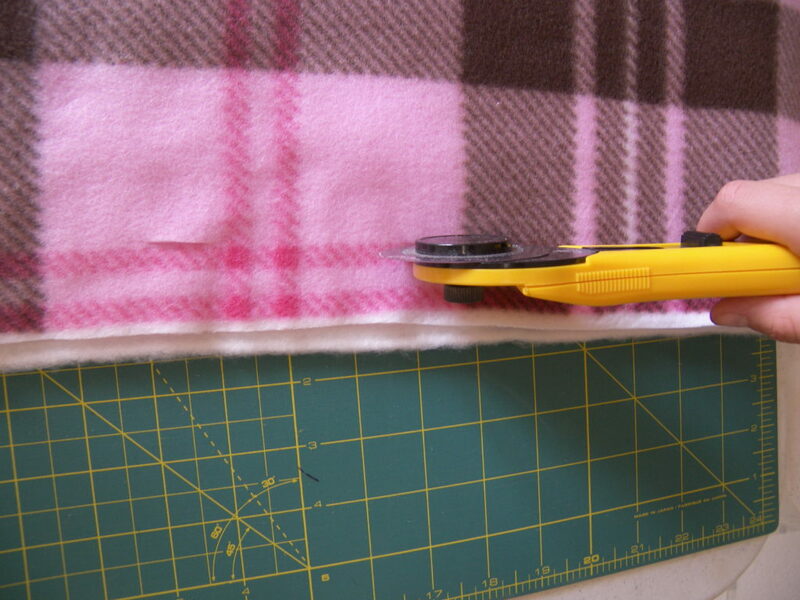 Next we cut fleece strips to make seperate ties, that’s right, we don’t use the fabric from the blanket for the ties. The advantages are, the finished fleece blanket is larger, it lays flat and does not curl at the edges and I personally feel it looks more finished. I am not able to tell you exactly how much extra fabric you will need, it will be an estimation based on your blanket size. On this one she alternated brown and white strips that were cut in two inch widths and six inch lengths. Well this is the best part! Much time has been spent on choosing just the right coordinating or contrasting fleece, using our math skills to make sure the finished blanket will be the correct size and that we have enough fabric for the ties, and then preparing the fleece to this point. At this time you can pull up a chair and tie. If you estimated the number of strips needed a few more may need to be cut if you run out, so keep the mat and rotary cutter close by. The ties are simply double knotted. A square knot would be the best, but here again at age 9 we have to decide if the child can tie 60-70 square knots without frustration. Gene Anne looks pretty relaxed in the first photo, so I think she just did double knots! Here she is with the finished fleece blanket and if you can believe it, this same blanket is at the foot of her bed now as she has many quilts and we try to switch them from season to season. Here is a preview of what my next post will be about, can you guess? If you said a fleece blanket on the quilting frame you are right, and it was made by Gene Anne just a few weeks ago! Share your thoughts on fleece blankets with us! This entry was posted in Uncategorized on June 24, 2017 by Carla. I have not seen this tying technique before, but it sure makes sense. Gene Anne’s fleece blanket is beautiful! These fleece blankets last forever. My oldest DIL made one for my husband when she and our son were first married 17 years ago. My husband is still using that blanket when he snoozes in his reclining chair. I have never seen the way you tied your fleece blanket before but it looks like it would work very nicely. Thank you for stopping by my longarm quilting blog. I'm so inspired by the quilt tops you send me and I hope my designs inspire you too. 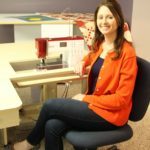 Learn more about me and my quilting services or contact me if you are ready to work together.